My favorite time of year - crisp air and beautiful leaves. This image of the Georgetown C&O canal near my office. Enjoy your weekend! My new favorite place to hang out in DC is the bar at the newly renovated St. Regis hotel! Recently renovated by Sills Huniford, the space is truly amazing. The historic hotel has been beautifully renovated but updated with modern furnishings and light fixtures that are easily reversable so no fears of the space 'dating'. They have some creative cocktails and probably the best sangria I've ever had (the fruit is strained out so you don't get those nasty bits in your teeth!) But it's the atmosphere that truly gets me, especially at night. Ebony paneling, an antique ceiling and tall windows. We had our local dc design bloggers happy hour here a few weeks ago and now I'm hooked! If you're ever in dc check out the hotel! I had the pleasure tonight to attend a lecture given by Michael Smith (seen on the left, with Ali Wentworth speaking to his right) at the Corcoran Gallery of Art here in Washington, DC. 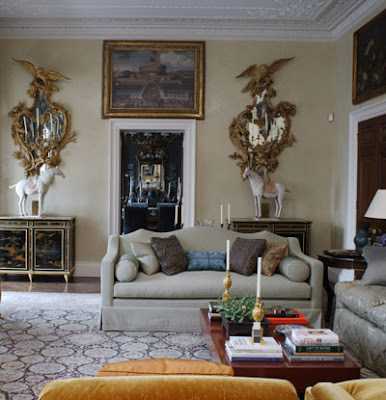 Michael is a very talented and now very FAMOUS interior designer thanks to the coverage of his work in the private quarters for the Obamas at the White House (which he would not talk about). However, no stranger to publicity, he had his first project published at the tender age of 24 in a major publication! 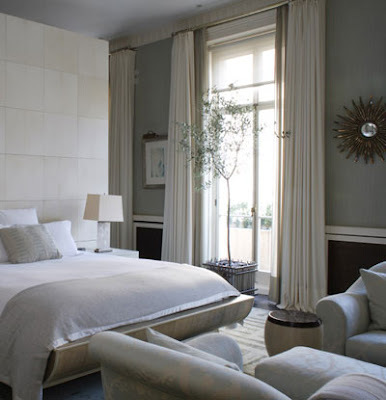 Images shown are from his website of one of my favorite projects he has completed, a townhouse in Eaton Square. Michael showed a great deal of images: both published and unpublished, older and recent as well as a brief rundown of his many product lines. 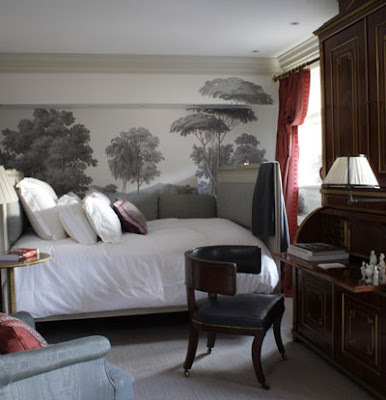 While talking about the bedroom shown above, probably one of my top favorite published bedroom images, Michael mentioned his philosophy of a bedroom as 'a crib' or a cozy retreat. 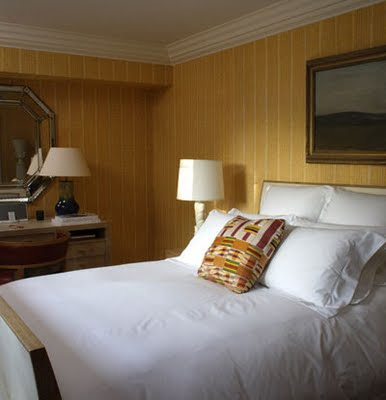 He is a fan of patterned walls and beds nestled against the wall. Michael quickly broke down his design philosphy in a very clever way and you can see examples of this throughout all his work: the mixture of 2 ideas (often opposing) that bring out the best features of both. 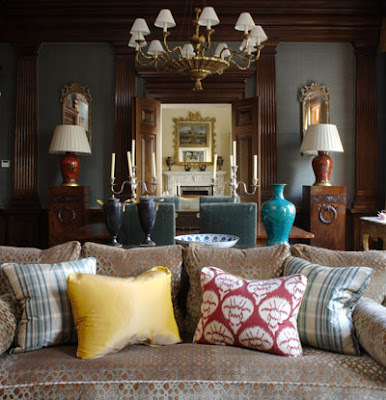 Whether it be mostly modern with an antique painting thrown in or English country with a few pieces from Marrakesh, this tension is where the interest lies in his work- the true definition of an eclectic interior! He believes the discord "brings you into the moment by its contrast". At the same time, Michael is concerned with balance. He never wants a room to be 'too simple, too fancy, too cluttered', etc. 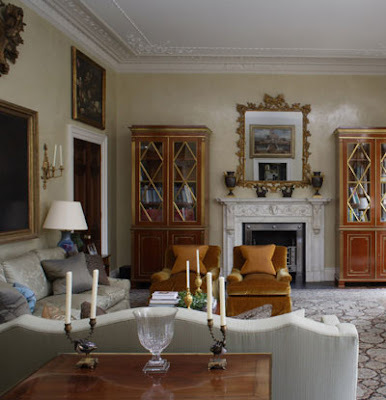 In a very formal dining room he'll throw in a sisal rug in contrast to a patterned or scenic wallpaper. Another of the mainstays of his work is investing in quality, classic pieces. He mentioned in his own homes (as he is always moving) keeping the same couches for decades and uphostering them when they get a bit shabby. I noticed throughout many of his own houses that he showed the same pieces kept showing up. If you love something, you will always make it work: Stay away from the overly trendy and never start from scratch! Michael said that being an interior designer is one of the most personal and private fields you can ever go into. You get to know your clients very intimately and you should never betray their trust, hence the 'don't ask don't tell' policy on the White House! He did however mention that his work there was to 'highlight the best of America' and not neccesarily the traditions of the White House. Some of the most interesting things he talked about were during the Q&A which was cohosted by his hilarious friend Ali Wentworth, actress and wife of George Stephanopoulos (whose house was recently in Elle Decor magazine). 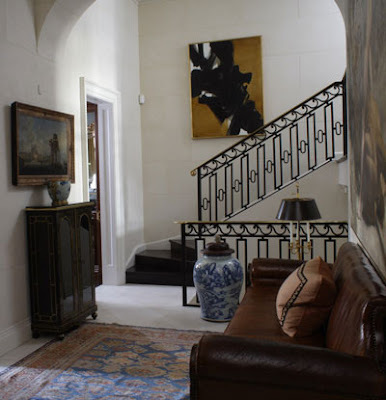 He mentioned his use of layering numerous smaller carpets in a large room. The reason? Not for the 'look' per say, but more because he felt it was hard to find rugs he liked in appropriate sizes! Michael easily (and often) admited to being proudly high maintenance. He said "I'm not the easiest decorator to have" because he wants to challenge his clients to be invested in their houses. He wants them to think about their choices and for their spaces to be true reflections of not just Michael's taste, but their own lives. He claims all of his projects are incredibly individualistic and won't ever take on a client who merely wants a copy of one of his previous jobs. I hope you all enjoyed these little tidbits I gleamed from the lecture; it was an entertaining and charming way to spend a rainy evening! All quotes are in italics. When it rains, it pours. First my HVAC broke, then my refrigerator (beware of GE monogram), I broke my favorite teapot, a pair of sunglasses split in half this weekend and then today my dvd player died after I was sick for a week. Better days must be ahead. When one door closes, another opens: here's hoping it's true. I've already rediscovered a new favorite teapot in my kitchen cupboards! Back to our usually scheduled programming tomorrow.